Fooling Nazi espionage may cost Lenny the trust of the girl who captured his heart. Will Natasha discover his secret D-Day reports, disguised as love letters to another woman? In these letters, Lenny gives the enemy misleading information about allied plans. Once Natasha arrives in London, he takes her for a ride on his Harley throughout England, from the White Cliffs of Dover to a village near an underground ammunition depot in Staffordshire. When he is wounded in a horrific explosion, she brings him back to safety, only to discover the other womanâ€™s letter to him. Will love survive the test of war? In the past Natasha wrote, with girlish infatuation, â€œHe will be running his fingers down, all the way down to the small of my back, touching his lips to my ear, breathing his name, breathing mine.Â Here I am, dancing with air.â€ In years to come, she will begin to lose her memory, which will make Lenny see her as fragile. â€œI gather her gently into my arms, holding her like a breath.â€ But right now, she is at her peak. She is ready to take charge of the course of their story. 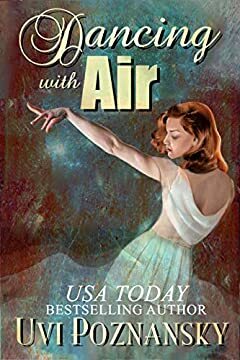 Dancing with Air is a standalone WWII romance, as well as the 4th volume of the family saga series Still Life with Memories, one of family sagas best sellers of all time. If you like family saga romance, wounded warrior romance, military romance or romantic suspense, you will find that this love story, twisting and turning through its marital issues, is a unique melding of them all.